All the sales figures are normalized and reported in USD billions unless noted otherwise. 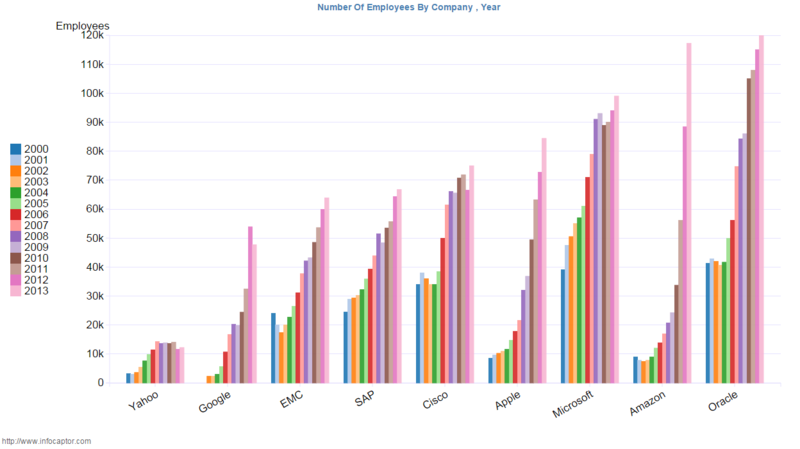 What is interesting to observe is the big spikes in Amazon's employee strength growth! 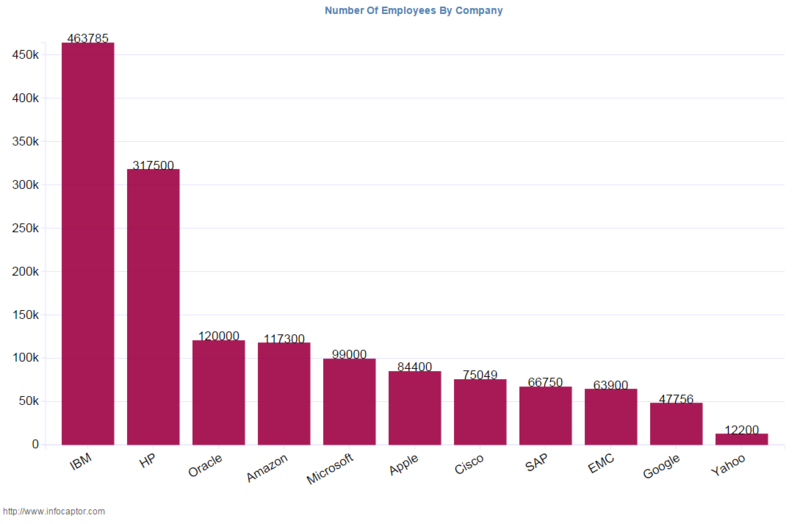 The sales-per-employee ratio provides a broad indication of how expensive a company is to run. Companies with higher sales-per-employee ratio are usually considered more efficient than those with lower figures. A higher sales-per-employee ratio indicates that the company can operate on low overhead costs, and therefore do more with less employees, which often translates into healthy profits. 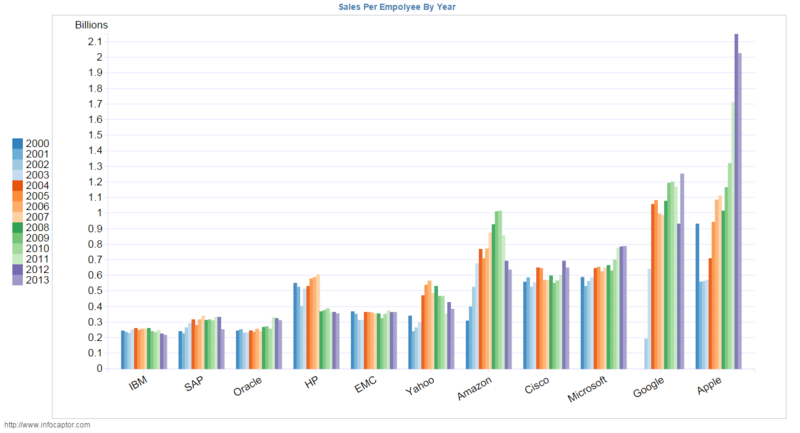 Looks like the big spikes in Amazon's employee strength is not justified by the down trend of sales-per-employee ratio. Does it mean that it has become more expensive for Amazon to keep hiring at this pace? Income per employee measures company's ability to use their employee resources effectively to create profits for the company. Thanks! I'm messing around with it now and it is fascinating. 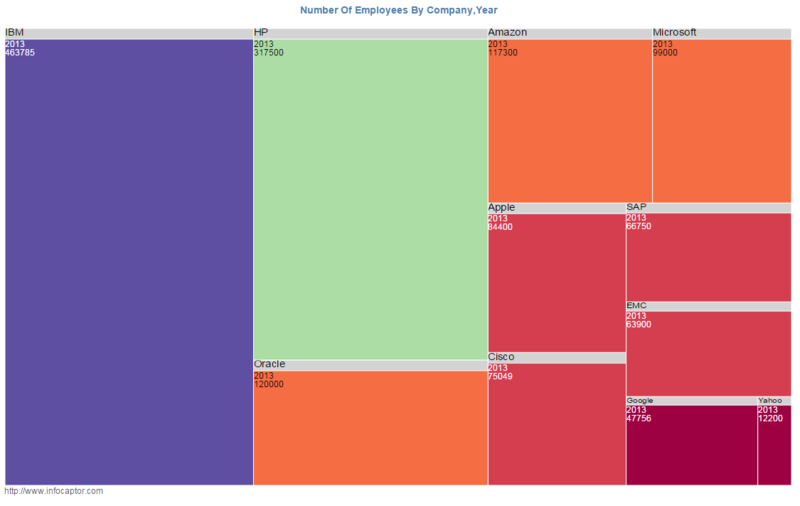 Do you use Tableau? If so I can share my workbook. Or, with your permission, I can make it public. I think that looks better, or at least has more potential. I wonder if you'd be willing to share your data so that I could take a stab at it visualizing it, too? I'm not a fan of bar charts although I see their utility for simple presentations. 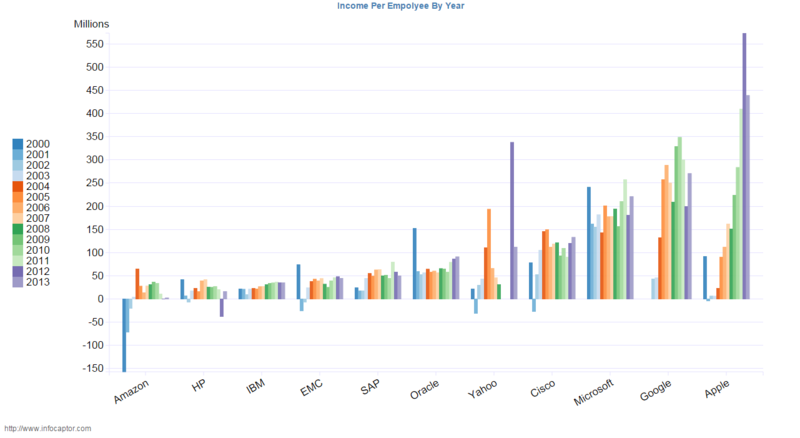 In this case you're comparing employee growth in one chart with sales per employee on another chart. When comparing two different metrics the x-y or scatter chart could be a better tool to show outliers, as you conjecture Amazon to be. Different colors or symbols could be used to differentiate companies. If a company is connected by a line it could show more graphically the change over time, e.g., that Amazon's ratio has plummeted. Interesting article, and one that shows that 9 times out of 10 a good old bar chart goes a long way to telling the best story. Also interesting that you use a tree map as your first Viz, but then the same data as a bar chart so it can be 'put into perspective'!